Bow made from a long piece of light brown wood (Pantone 7509C), tapering to either end, and strung so that the bow forms a simple, shallow arc. The wood is knotted and slightly irregular, the shaft slightly oval in section throughout. The surface has been polished. Light yellowish brown plant fibre (Pantone 7508C) has been wound around the bow shaft 49.6 mm from one end, forming a 12 mm long band that acts as a stop, to keep the end of the bow string located in the correct position. This binding is very loosely wound at present. The bow has been strung with a single cord made of twisted sinew. This has been attached to the end with the fibre binding with a single loop, fitted over the bow shaft, the cord then pulled through this and its free end knotted off. The string has been fastened to the other end of the bow by looping it over the shaft, winding it around the body three times, and then wrapping it around the bow string and tying the end off. The bow string is no longer taut, and has two knots along its length that may indicate old repair work. There are two further objects attached to the centre arc of the bow shaft. The first of these is a hollow 'signalling device' or slit drum, carved out from a solid piece of wood. This device is roughly semicircular in plan view, with one strongly curved side, facing the bow shaft, and a very slightly convex side opposite. The back of the device is convex, the underside has two flat surfaces that slope up towards each other, with the resulting angular apex running along the length of the underside of the object; the upper and front surface is convex again, but with a narrow rectangular slit cut into the surface at its widest point. The rough interior surface of the wood is visible through this slit; the outside surfaces have been smoothed and stained a darker reddish brown (Pantone 462C). A decorative band has been carved across the upper and lower surfaces, at right angles to the flatter lower edge, with irregularly placed horizontal cuts across the surface. A series of short lozenge shaped cuts have also been made across the ridge running along the underside of the device. Two holes have been bored through the strongly curved side, and the device has been attached to the bow shaft by two strings made of twisted plant fibre, which have been threaded through these holes and then tied together. Only one knot is visible; the other must be located inside the hollow body of the object. The second object attached to the bow shaft is fitted over the opposite end and consists of three short rods of wood, one of which has a strip missing, with glue visible around the damaged area, and copper wire bound around each end, each wire twisted several times to secure it. This looks like an old repair. Each of the three rods is pierced near either end, and tied together by double loops of twisted plant fibre string through each end. These are knotted together, leaving long string trails that are further knotted at each end. The object is complete, but looks to have repairs to the bow string and bundle of rods, while there is a small hole in the back of the hollow signalling device. The fibre binding at one end is very loose, and there is no binding present at the opposite end, where something similar might be expected. Length of bow (when strung) 1294 mm, width of shaft at centre 24.8 mm, thickness of shaft at centre 21.7 mm, diameter of bow string (taut area) 2.6 mm, diameter of cord wound around shaft 2.7 mm, length of signalling device 75.5 mm, width of device 25.3 mm, thickness of device 21 mm, width of slit 3 mm, width of string attaching device to bow shaft 0.8 mm, length of rods 49 mm, diameter of rods 5.7 mm. Collected by Percy Horace Gordon Powell-Cotton and his wife Hannah at Li Rangu on 27th April 1933 during a shooting expedition. At this time, Li Rangu was a centre of foreign contact for the district (N. Barley, 1994, Smashing Pots, p. 144). Powell-Cotton gives the Zande name for this object as bato, and tells us that the slit drum was used for signalling. For a similar wooden slit drum attached to a Zande bow, see 1917.25.7. Nearly a decade earlier, Larken recorded the local term for bow as mboto, and stated that bows and arrows were not in general use amongst the Zande, while those he did see were all "short and not very stiff, none exceeding three feet in length" (P.M. Larken, 1926, "An Account of the Zande", Sudan Notes and Records IX no. 1, p 41). Currently on display in the Upper Gallery, case 13A. Accession Book Entry [p. 248] 1934 [insert] 8 [end insert] - MAJOR P. H. G. POWELL-COTTON , Quex Park, Birchington, E. Kent. Specimens collected by himself & Mrs Cotton, during hunting trips, 1933, viz: [...] [p. 260] - From the ZANDE tribe, LIRANGO, YAMBIO, DINGBA & TAMBURA [...] [insert] 118 [end insert] - Bow, bato , of wood, circular section, tapering ends, with miniature xylophone attached, for signalling. LIRANGO (858). Additional accession book entry [p. 259] - 1934.8.118 - Number given AP l[ength] = 1310 mm. + Rasp [red biro] A19 F12 3-4. Card Catalogue Entry - A.E. SUDAN, LIRANGO, AZANDE TRIBE. 858. Bow, bato , of wood, circular section, tapering ends, with miniature xylophone attached, for signalling. (With arrow bearing same number, see separate card.) [NB: this is 1934.8.119]. Coll. by donor and his wife during hunting trips, 1933. d.d. Major Powell-Cotton 1934. [insert] l[ength] = 1310 mm [RTS 27/7/2004; tribes and object cards bear the same information]. Related Documents File - Typewritten List of "Curios Presented to Dr. Balfour by Major & Mrs. Powell-Cotton. Zande Tribe". 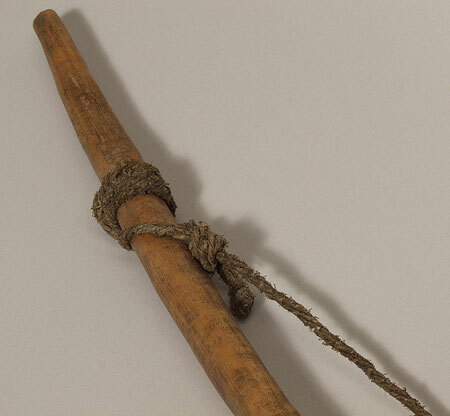 This object appears as item 858: "Bow, wood, circular, 4'3" long, gut string, native name Bato , 1 arrow, 3 barbs 2', native name Mamara , 27/4/33 Lirango, about 4.40 N, 28.20 E". Also contains details of a cine film 'some tribes of the Southern Sudan', taken by Powell-Cotton during this 1933 expedition, copies of which are now in the National Film and Television Archive and the Powell-Cotton Museum in Kent [RTS 14/3/2005]. Written on object - 1934.8.118. Bow, bato , with attached calling instrument. ZANDE, LIRANGO, 4 ° 40' N, 28° 20' E. d.d. Major Powell-Cotton, 1934. (858) [RTS 23/2/2004]. Currently on display with label - SUDAN, LI RANGO; AZANDE. Bow, bato, to which is tied a nutshell signalling device, which is struck by the string. Donated by Major P.H.G. Powell-Cotton. 1934.8.118 [RTS 2/2/2004]. Sparks, Rachael. "Zande bow" Southern Sudan Project (in development). 03 Jan. 2006. Pitt Rivers Museum. <http://southernsudan.prm.ox.ac.uk/details/1934.8.118+.1+.2+.3/>.